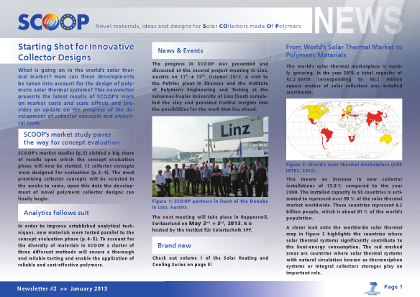 The final SCOOP newsletter contains the highlights of SCOOP's results from the past 3.5 years of research. It is available for download here. 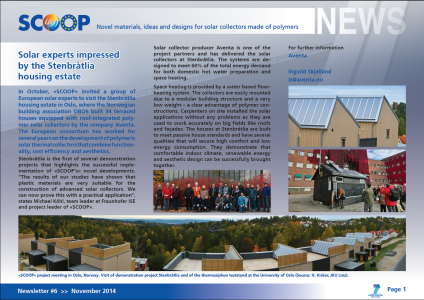 SCOOP newsletter No.6 covering the building integration of polymeric solar collectors in the Stenbråtlia housing estate in Oslo is now available online here. 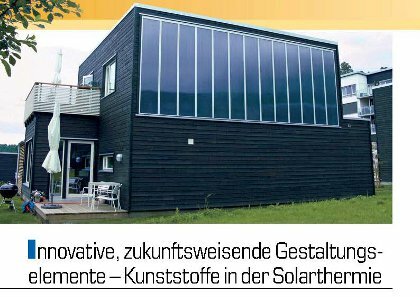 The German online magazine BINE Informationsdienst covers the demonstration of building integrated polymeric solar thermal collectors in Oslo and further results from the SCOOP project. The full article is available here (in German). 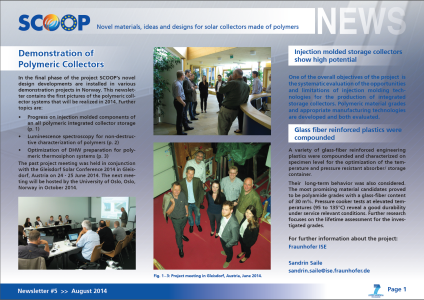 The new demonstration system for building integration of polymeric solar collectors by SCOOP project partner aventa was presented to the public in October 2014. 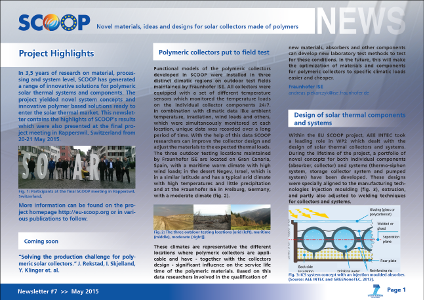 More details are available in the official press release by Fraunhofer ISE (German version). 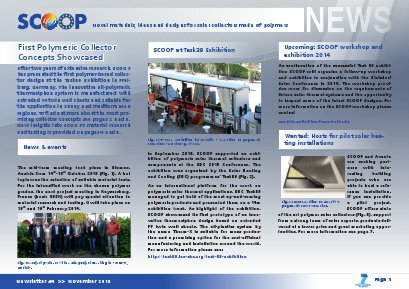 The latest SCOOP newsletter is now available for download here. SCOOP project partner Aventa is seeking volunteers who are able to host a reference solar heating installation in Northern or Central Europe. If you are interested in collaborating you can find more information on Aventa's website. 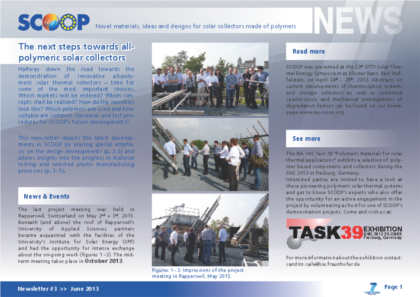 The next project meeting is held in conjunction with the Gleisdorf Solar Conference 2014 on 24 and 25 June 2014 in Gleisdorf, Austria. 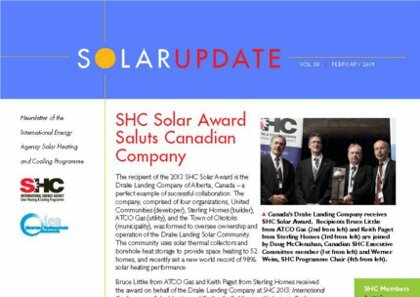 The SHC Task 39 Exhibition of polymeric components showed the feasibility of all-polymeric solar thermal systems and highlighted their potential. Download the related article published by Elsevier here. 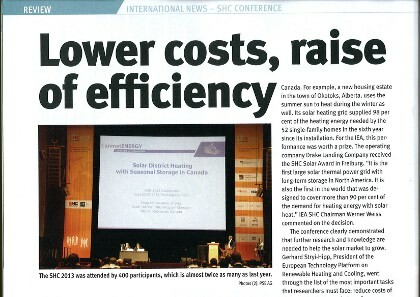 SCOOP in "Solar Update Vol. 59". Get yourself an update and download the latest article here. SCOOP is looking forward to the next project meeting on 18+19 February 2014 in Kaysersberg. Hosted by DS Smith Kaysersberg. Sign up for our newsletter and be the first to receive the latest news!